The Elk Grove Thundering Herd celebrates after winning the Sac-Joaquin Section Division I baseball title against the Tracy Bulldogs at Sacramento City College in Sacramento on Saturday, June 3, 2017. The Thundering Herd won the game 22-6. When the season started, three returning starters led the charge for one of the most storied sports programs in the region. This would be their season, their time. But there were doubts for the Elk Grove High School baseball program after a 1-4 start this season that improved to 6-7 amid a daunting schedule against powerhouse programs from across the state. There is no doubt now about the Thundering Herd’s remarkable staying power and results after Saturday afternoon’s offensive outburst at Sacramento City College. Erupting for 15 runs in the top of the fourth inning, including 14 with two outs, Elk Grove stampeded home with a 22-6 victory over Tracy in a game halted after five innings due to the mercy rule, reclaiming the Sac-Joaquin Section Division I series in two games. It’s the eighth championship since 2003 for coach Jeff Carlson and the 11th in program history, tying small-school power Central Catholic of Modesto for the most all time, spanning seven divisions. 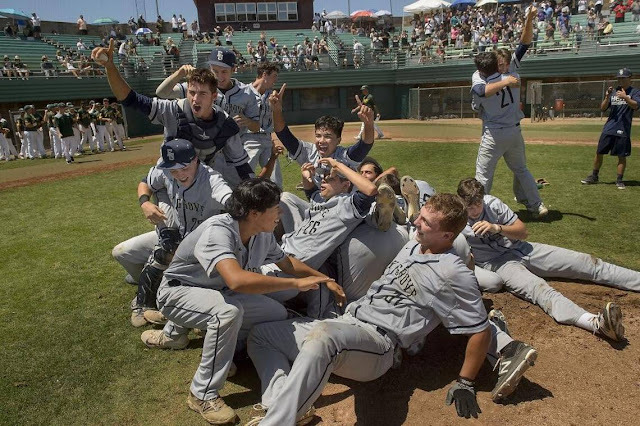 Elk Grove represents the definitive dynasty for this section in this sport, punctuated by the second three-peat in the run and the fourth title in the last five years. Elk Grove also has 10 Division I North titles since 2002, making for one crowded trophy case. And this is a team that will return the bulk of its lineup next season. No D-I program has won four straight titles since the tournament started in 1976. As he has throughout the playoffs, USC-bound senior Riley Lamb led the way. He was one of the three returners along with junior shortstop Tanner Carlson, son of the coach, and junior first baseman George Spithorst. Carlson and Spithorst also produced throughout the playoffs. Lamb went 3-0 in the playoffs and swatted three home runs, including a two-run bomb in the fourth to make it 15-6 as the Herd pounded out 22 hits. Brian Freitas, yet another junior, earned the win, his fifth without any defeats this season. Elk Grove (23-10) batted around three times in the fourth against a Tracy team that came into the weekend at 25-4. The Herd went 6-0 in the playoffs and won 15 of the final 16 games. Junior Jake Jordan had two RBIs in Elk Grove’s 4-1 Game 1 win in which Lamb pitched, and his RBI triple in the fourth put Elk Grove ahead for good, 8-6. Freitas had three RBIs and Shawn Zamora and Tanner Hutcheson two each. “We had a lot of guys who worked really hard and who really wanted to get it done,” Jordan said.